Mary Shelley, the precocious author of Frankenstein, lived in a whirlpool of tangled emotions and events. As a mother, she lost three of her four children and almost died of miscarriage. As a lover, she eloped at age 16 with a married man, only to find herself betrayed when he had an affair with her half-sister. As a writer, she gave birth to one of the iconic works of modern fiction, creating a myth that still resonates today. The daughter of the formidable Mary Wollstonecroft, who was a pioneer feminist and advocate of free love, and of the equally formidable William Godwin, who was the first proponent of political anarchism, Mary Shelley was part of a circle of artists who lived perpetually on the edge. Her husband, the brilliant Romantic poet Percy Shelley, left in his wake a trail of unhappiness, suicide, and family tragedies. He abandoned his first wife, eloped with Mary and her half-sister Claire Clairmont, and in the summer of 1816, Mary Shelley, Percy Shelley, Lord Byron, Claire Clairmont, and John Polidori (Shelley’s physician), found themselves together in Villa Diodati outside Geneva. Storms and incessant rain forced them to stay indoors, and to amuse themselves they read ghost stories to one another. To amuse themselves further, they decided to write their own ghost stories. It was in this auspicious environment that Mary Shelley, then aged 18, produced Frankenstein, writing it in a white heat of inspiration and surpassing all of her companions in the intensity and mastery of her creation. Since then, it has become one of the central myths of our culture, providing material for countless adaptations in film, theater, musicals, works of art, and literary sequels. The joys and perils of motherhood, the betrayal of parents, the abandonment of children, the hovering shadow of infant mortality, the longing for affection, and the sting of loneliness and rejection merge together in Mary Shelley’s supreme creation. The Creature that Dr. Frankenstein produces, an assemblage of disparate elements, coalesces into a monster with a human soul. His horrific appearance conceals the gentlest heart. Through no fault of his own, he is forced to descend into evil deeds. In ERC’s theatrical concert Frankenstein: Every Woman’s Nightmare, the Creature emerges as a representation of Mary Shelley’s inner world as a motherless child, as abandoned by her father, and as a woman-creator of life by giving birth to her own children. The script, based on Mary Shelley’s letters, diaries, and excerpts from the 1818 edition of Frankenstein, reinterprets the myth of the Creature through a web of psychological symbols and analogies. Film montage, combined with music, creates a parallel narrative to the drama that unfolds in the script. The concert features some of the most exquisite Bach-inspired music of the 19th century, including the Chaconne (Bach-Busoni) the Prelude in B minor (Bach-Siloti), the organ prelude on the B-A-C-H motive by Liszt, in addition to arias from Bach’s St. Matthew Passion, songs by Schubert, and Liszt’s variations on Weinen, Klagen, Sorgen, Zagen, among others works. The highly suggestive and atmospheric sound palette includes piano, oboe, and soprano voice. If you think it is lonely at the top, then how would you feel if your loneliness stretched into eternity? Who could accompany you in that interminable journey? The nightmare of a being for whom there is no rest, and for whom eternity is a perpetually renewed torment, is portrayed through three parallel stories: Jonathan Harker’s ill-fated journey to Castle Dracula, Count Dracula’s surprising life story, and the transformation brought into his life by Mina Murray. Excerpts from Bram Stoker’s iconic novel, as well as contemporaneous literature and poetry, are interwoven with highly atmospheric music that includes songs by Schubert, Wolf, and Strauss’s breathtaking Befreit, instrumental music by Bartók, Berg, Messiaen (a haunting excerpt from the Quartet for the End of Time and the Vocalise-Étude) and Ravel’s Tzigane. 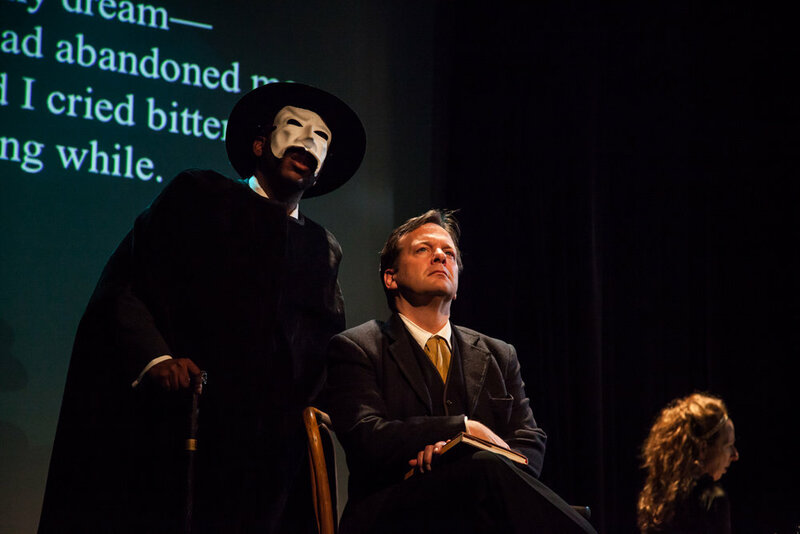 In ERC’s innovative theatrical concert, Dracula emerges in a new guise, as a being who is closer to us than we would like to think. The drama of Dr. Jekyll and his demonic double unfold in a psychoanalytic tale of horror in turn-of-the-century Vienna. Featuring an eclectic mix of repertoire by Mahler, Schubert, Schumann, Webern, Berg, Zemlinsky, Brahms, Pfitzner, and Schoenberg. Seduction, Smoke and Music tells the love story of Frédéric Chopin, the renowned composer, and George Sand, the infamous cigar-smoking French novelist and feminist. The performance explores the unfolding of their passionate relationship over a decade. Seduction, In the summer of 2011, Smoke and Music: The Love Story of Chopin and George Sand received international acclaim at The Tuscan Sun Festival in Cortona, Italy. Starring superstars Jeremy Irons as Chopin and Sinéad Cusack as George Sand, and featuring ballet greats Irina Dvorovenko and Maxim Beloserkovsky of American Ballet Theater, and the internationally renowned cellist Nina Kotova and pianist Simon Trpčeski, the sold-out show was a glamorous event in the magnificent setting of the nineteenth-century Teatro Signorelli. The show was performed again in July 2012 at the Festival del Sole in Napa, California, in the magnificent Castello di Amorosa.